Names can complement your kitty's coloring and personality. 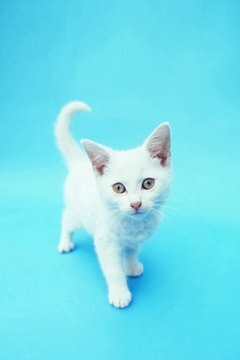 Choosing a name for a white kitten can be as agonizing as choosing a right shade of white for your apartment. With so many shades and names to choose from, you might find yourself tossing a coin between winter kitty and Arctic kitty, or did someone say "Magnolia?" Flower names and kittens are a match made in heaven because both are gifts from nature. Flower names work best for female kittens -- if you called your little boy "Daisy," the neighborhood kitties would kid him to death. For a girl though, what could be more simple, fresh and unpretentious than Daisy? Camelia and Lily work well if your kitty is a delicate little flower. If you want to get literary, you could name your kitty Elaine, or Lainy for short, in honor of Tennyson’s famous lily maid. Getting a little more botanical, Cicely, in homage to the ethereal Sweet Cicely (Myrrhis odorta), is ideal for an angelic white kitten. Snowball, Snow White, Snowflake, Frosty, Snowdrop and Snowy are common names for white cats, but if you want to get a little more exotic, how about Zima, which means "winter" in Russian? If Kitty is a little haughty and naughty, Snow Queen, after the wicked queen in Narnia, might be apt. Your soft, purring white kitten is a little luxury item, so why not name her after one? Wedgwood, the delicate blue and white china introduced in the 18th century, is perfect for a white kitten with beautiful blue eyes. If your idea of luxury is putting your feet up with a refreshing glass of white wine, think about Savvy, a diminutive for sauvignon blanc wine. If Baileys Irish Cream is one of your favorite special occasion tipples, consider calling your little darling Bailey. How Much to Feed an Umbrella Cockatoo?